When all the classic product advertising techniques have been said and done, what’s a label left to do? Stage series of flash mobs around the world! 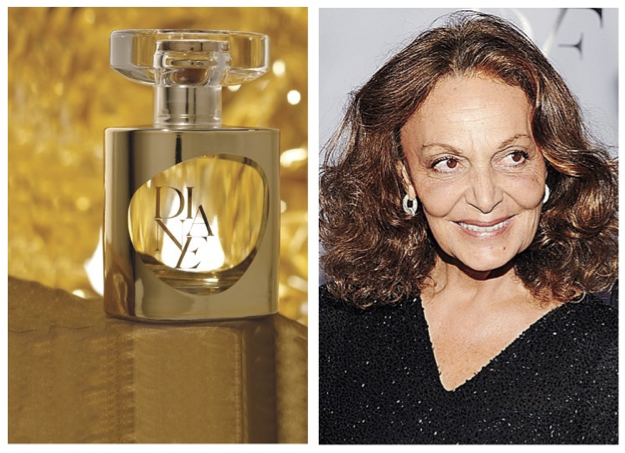 That’s exactly what internationally known designer Diane Von Furstenberg did. To commemorate the launch of her brand’s newest Fragrance ‘Diane’, the designer decided to orchestrate flash mobs throughout Europe and the U.S.
She started the global events off in New York Thursday, September 22 with multiple groups of models in DVF’s iconic wrap dresses that came together in Times Square, Union Square, Soho and the Bowery. The fabulous models formed multiple flash mobs chanting “DVF, DVF!” down the streets of Manhattan. Along the way, the models distributed scented ribbons and offered passers by the chance to win free bottles of ‘Diane’. After the event, Von Furstenberg made a public appearance at Bloomingdale’s on the Upper East Side and signed perfume bottles. Following the New York appearance was an event in Paris on October 5 across the river from the Eiffel Tower. Over 100 models gathered and danced to Chaka Khan’s “I’m Every Woman,” and drew in a major crowd. Just after the mob, Von Furstenberg met with fans and signed autographs in the Sephora flagship on the Champs-Elysées. The flash mob celebration continued throughout Europe in Madrid, Lisbon, Warsaw and concluded with a performance in Milan on October 13. Von Furstenberg has always been known for spotting and starting all the newest trends in fashion, and this unique launch of her latest fragrance continues to show off her creative fire making her even more of a household name! ‘Diane’ is currently sold exclusively at Sephora and at Diane Von Furstenburg. It can be purchased in a 50mL or 100mL bottle for $65 and $90 respectively. Halloween is the one night of the year you can be absolutely anyone or anything you want and with the holiday only a short time away, everyone is in a frenzy planning out their costumes. They have everything down from the clothes to the hair, but there’s something many don’t consider to show off their Halloween spirit, manicures! Here are a couple of nail designs that’ll add style and flair to any costume and really get you noticed on the scariest night of the year. 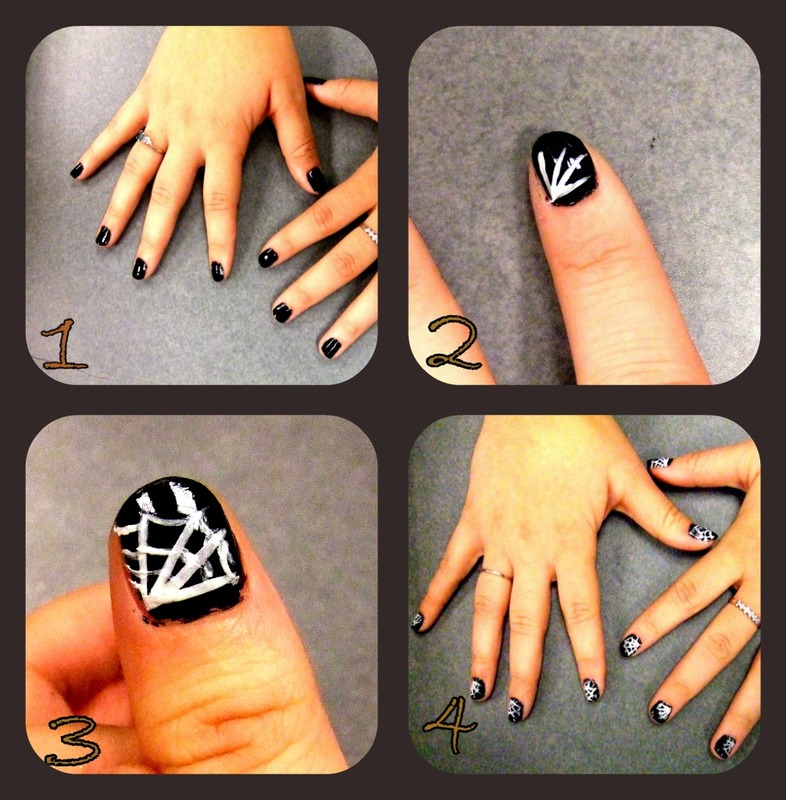 If you’re looking for something chic and elegant, you can’t go wrong with a spider web manicure. It’s classic and has just the right amount of spook without looking over the top and cheesy. It’s also easy to create in four simple steps! Step 1: Paint nails with two coats of black nail polish and let dry for at least 10 minutes. You want to avoid smearing the white on the black so take extra time to dry if needed. Step 2: Take a fine tip white nail polish and carefully draw strokes diagonally starting at the bottom corner of the nail. The number of strokes you draw can vary depending on how thin the tip of your nail polish brush is. The important thing is to make sure the lines don’t each other except at the center. Step 3: With the same white nail polish, connect each of the strokes across with little swooping lines. This part requires a little more precision so I suggest letting the lines you made in step 2 dry for a few minutes before connecting them to avoid smudging. Step 4: Let the designs dry and then apply a clear top coat and you are ready to wow at any Halloween party! **Tip - For added glamour, go over the white spider web design with a thin glitter nail polish before applying the top coat and your nails will sparkle all night! If you’re looking for a more funky and festive Halloween look, a candy corn manicure is a vibrant and unique way to show off your holiday spirit. Though this design is a little tricky and may take a couple of tries, it’s a guaranteed crowd pleaser that will get you nonstop compliments! Step 1: Paint Nails with two coats of orange nail polish and let dry. It is essential for this design for the polish to be completely dry. Try applying the orange the night before you do the rest just to be safe and give it enough time to dry. 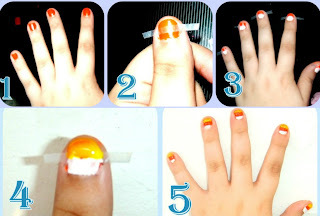 Step 2: Cut pieces of scotch tape (or any tape you have on hand) into strips about 1/3 the length of your nail and place them over the center of each nail. This is why it is important to make sure the orange is completely dry—you don’t want the polish coming off with the tape. Step 3: Paint the exposed nail under the taped portion with white nail polish and let dry a few minutes. Step 4: Paint the exposed nail above the taped portion with yellow nail polish and let dry. Don’t worry about being perfectly precise with the white and the yellow in these two steps, it will all look nice and neat when it’s done. Step 5: Let the polish dry at least 10 minutes then carefully remove the strips of tape from each nail to expose the orange in the middle. Apply a top coat to seal and add shine and you are ready for stylish Halloween night in or out! **Tip - If the polish smudges over the edges or isn’t as precise as you would like. Take a Q-tip dipped in nail polish remover and smooth out any imperfections. Whether you’re looking for something spooky and sophisticated or sassy and sweet, these designs will definitely get you noticed! It all started with the very first sweatband. An Austrian footballer named Tibby Wegner, went to Fred Perry with the idea in the 1940s. The brand then launched their most famous shirt in 1952: a simple polo with the Laurel Wreath logo. From then on the brand blended sportswear and street wear. Fred Perry has previously worked with the likes of Amy Winehouse and Raf Simons on collections. The collaborations with such people expanded the brand past the simple polo it is known for. The Amy Winehouse collection brings an edgy vibe to the fashion, with a houndstooth pattern being a staple in many of the clothing items. The newest collection features Richard Nicoll’s designs for the AW11 Laurel Wreath Collection. Opposites attract in this collection; the designer paired wool and patent leather, tailored shirts and oversized dresses. Instead of going with the bright colors and 60s feel of other designer collections this season, Nicoll used rich hues, mostly deep reds and dark blues. Nicoll designed a collection that truly stands out, from other brands and from the signature Fred Perry look. Straying away slightly from the simplicity that is found in many of the Fred Perry designs, Nicoll incorporates plaid and fabrics not often used in the brand for a very unique look. The collection features patent leather accessories as well; including, a belt, a satchel and a vivid red camera bag. “Fred Perry’s tomboy becomes Britain’s Jane Birkin, wrapped in Serge Gainsbourg’s coat,” the website overview of the AW11 Laurel Wreath Collection said. All in all the collection is truly innovative. I’m looking forward to seeing who Fred Perry will work with next to create yet another unique collection. Kanye’s Spring Collection: Fashion Hit or Miss? 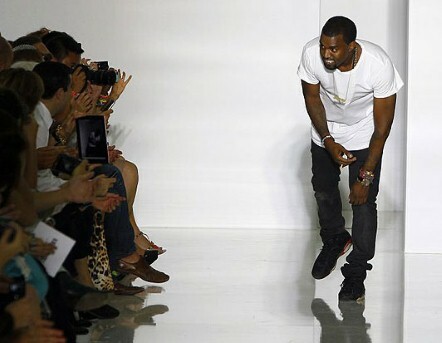 Kanye West can now call himself a fashion designer, along with being a well-known rapper. Kanye’s women’s line hit the runway in Paris for Paris Fashion Week. He said that his collection is “Miami meets goth”. Kanye’s line includes leather pants and dresses along with some furs; his collection also incorporated long skirts and a few dresses. Among the people to see his collection were Alexander Wang, Jeremy Scott, Mary-Kate and Ashley Olsen, and Lindsay Lohan. One of the things he hopes to overcome is the stereotype of celebrities that turn into designers. Kanye presented his line in a high school in Paris and had everyone waiting to see what he would bring to the runway. Although critics were left uncertain about Kanye’s new line, people in the crowd weren’t hesitant about what his collection brought out. In an interview with the Associated Press, Jeremy Scott, a designer in the US, said, “Kanye had impeccable taste and you see his taste level is up there”. His collection might have had mixed reviews but it doesn’t seem to be putting him down. He has finally come up with a collection he can call his own and definitely made a stamp on Paris Fashion Week 2011. Although his reviews weren’t the best his collection is making headlines and is the topic of a few fashion blogs. If you have time you should check out Kanye West’s collection for yourself and see if you agree with the critics and think his collection could use more work, or if you think that his collection is perfect the way it is. When hearing the words Lizard Thicket, I am sure the first thing that came to mind was not a trendy, eclectic boutique, but more like a blank stare. Don't let this interesting name deter you from stepping inside this one of a kind shop, located at 3355 W. Chandler Blvd in Chandler, AZ. This small chain offers a wide range of unique clothing, accessories and jewelry - all of which are definitely not something you will find at a Forever 21. The store can be comparable to what you will find at the Nordstrom's Brass Plum department and an Anthropologie, except the prices are definitely more fitting for all of us college fashionistas. For it being a one of a kind boutique, the prices are great. Tops and dresses ranged from $25-45 along with the bottoms and their bright, gem stone jewelry ranged from $16-35. They also had a wide range of sale items, patterned, chiffon shorts were just $17, so there really is something for everyone, even if you are on a strict budget. Another great thing about this boutique, is that it is the only one out here in the desert. The store is originally from Georgia and that is where the unique name comes from too. The buyers for the store also only buy 6 of each item, guaranteeing that there aren't many out there who will have the same piece you just bought; something that is super important to any fashionista when trying to stand out, especially on such a large campus like Arizona State University. So, if you are a fashionista looking for a new place to find fun tops, skrits, shorts and dresses that no one else will own, look no further than Lizard Thicket. Although it is across from the Chandler Mall, where most flock, it is worth the trip across the pavement. There are one of a kind pieces at reasonable prices that you will never see any place else. Not to mention, the clothes are good quality and are definitely not like anything you will find at a Forever 21. Do you have extra T-shirts laying around and taking up your precious closet space? Don't throw them away just yet. Here you can learn how to inexpensively restyle your closet! Your friends will think you're a fashion-craft-genius, when all you need to be able to do is soak fabric and cut in a straight line! The first thing you’ll need is a T-shirt. The two shirts that I used were on sale in the guys section of Urban Outfitters for $2.50! Thrift store T-shirts also work well. One thing you have to take into account is the color of your t-shirt—the darker the color, the more your bleaching will show up. However, don’t be afraid to try something else! Orange is the hardest color to bleach, but as you’ll see it can be done! Next, you’ll need to get a bowl to put your bleach in. Because I am doing two t-shirts, I chose the bigger metal bowl. But a simple pie tin will work if you’re just doing one! You’ll need to get your bleach out now. I put two rubber bands on the bottom of each t-shirt, just to give the bleaching a little more texture. However, this is entirely optional. Be creative with this! Move to a place outside where there’s not a risk of spilling bleach on carpet. You should have 1/2 bleach and 1/2 water in your bowl. I used a cup and a half of each, but if you’re only doing one shirt you can use less. Also, this is the time to put on gloves and make sure you’re not wearing any clothes you need to worry about getting bleach on. Now you can put your shirt(s) in the solution. I only dipped the bottom third of the shirt; basically, however much you are planning to tassel. Using the metal utensil, make sure your shirts are soaking up the solution. Then, you can leave the T-shirts to soak. Keep an eye on them to make sure they don’t bleach more than you want to. I left my shirts for 15 minutes and the seafoam green one was dyed all the way white. The orange one, however, wasn’t very different so I left it for another 5 minutes. After the 5 minutes, the orange shirt was a light peach color. After this, take out the shirt(s) and ring them out into the bowl. Make sure you’re wearing your gloves! Put the shirt(s) in the washing machine with a little soap to get rid of the bleach smell. Wash and dry them. You shirts should look similar to this! Take your scissors and cut 1 inch strips at the bottom of your shirt. Remember—you can always cut more later, so don’t cut too far at first! Just keep trying it out to see what looks good. It’s all up to you, so get creative! My shirts had about 14 strips on each side. I got wooden beads to make a cute tribal look, but it’s entirely up to you! I used a bobby pin to push the fabric through the bead and I put them on randomly to have an artsy feel. For the orange shirt I put them on every other tassel. Now you’ve got a unique T-shirt that’s all your own creation! So, throw on your favorite shorts and a pair of sunglasses and impress away! As a fashionista, the one thing I find most horrifying is actually re-wearing an outfit. I know . . . how can anyone possibly not wear an outfit twice? But I have actually found a solution to the problem by archiving my closet and constantly purchasing new items so that I can go nearly 5 months without a single repeat. My closet archive is probably the most crucial piece of the solution, as without it there is no way I could remember the last time I wore something, as I forget what I ate for breakfast by dinner time. On the other hand, the constant purchasing of clothing, shoes and accessories have began to take a toll of my strict college budget. I actually find myself skipping meals to save a few dollars so that I can purchase the latest Sam Edelman wedges. With all that being said, I decided I have to put this ridiculous cycle to an end. Which brings me to ’30 Days of Style’. For this fashion challenge, I have picked out ten basic items from my closet and those are the only items I am able to wear for the next month. The 10 items I have chosen. I have also included in the guidelines of the challenge that along with the ten items pictured above, I can also add accessories including jackets, sweaters, tights, belts, hats, shoes, jewelry and headbands. I personally do not think this will be too bad. But, when I have brought this up to other people who know me, they scoff and tell me they will pray for me. No worries though, as I have confidence in myself, and I know that even though this may be slightly tough, I can definitely do it! 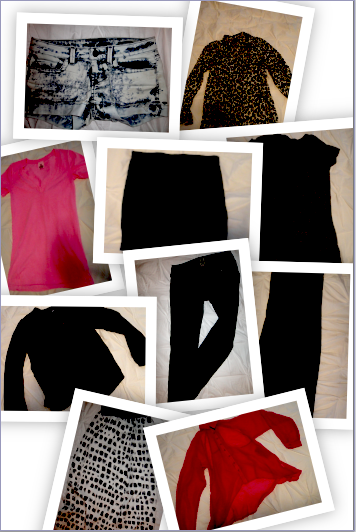 So please join me on this journey for the next month as I attempt to only wear the above items in 30 unique ways! Karolin Wolter recently announced that she is taking her modeling career in a different direction by becoming a plus-size model. In the past few years, the German model has taken her strut down the catwalks and been the advertising face for designer names like Marc Jacobs, Givenchy and many more in between, though she had taken a few modeling seasons off. At only 20 years old, Wolter is choosing to model with Ford+, the plus-size portion of the agency, to see where her career will take her next. Crystal Renn, a well known plus-size model with Ford+, has conquered an incredible amount of modeling feats since her career started though she originally suffered from body issues and even battled anorexia after recommendations to become skinnier by a modeling scout. Overcoming the recommendations that she lose more weight, Renn has appeared in numerous publications and campaigns, been the first plus-size model on the cover of Harper’s Bazaar, and written her own book on struggles in the modeling industry called Hungry: A Young Model's Story of Appetite, Ambition and the Ultimate Embrace of Curves. Robyn Lawley is another plus-size model with Ford+. Many models who make the transition to plus-size modeling are very successful in their business endeavors. According to many sources, Wolter’s agent, Gary Dakin with Ford+, said that she is “absolutely thrilled” to begin her career as a plus-size model. The distinction between plus-size and straight modeling has changed over the years, but regardless, we can’t wait to see what this young beauty has in store once her plus-size career takes off! If you’re searching for something unique and charming, head on over to Frances Boutique. It is a locally owned boutique right here in Phoenix, Ariz. Frances is a blend of old and new. You can find vintage pins, one-of-a-kind journals, novelty items, vintage clothing, nail polish and more. It is a treasure trove for those searching for the perfect outfit that no one else will have. Over the years Frances has been featured in multiple magazines, such as Lucky, Phoenix Magazine, New Times and Java, online articles and newspapers. In Phoenix Magazine Frances held the title of “Best Accessories.” With all of these titles and rave reviews, it is no wonder the boutique is doing so well. Customers of all ages can be found inside. Frances has largely expanded over the past 5 years. Bryant opened Frances Studio which stocks unique shoes and an array of TOMS. Smeeks, a candy store that has mostly vintage candy and also novelty items, was opened as well. A blog has surfaced that includes information about the store and events that involve Frances and Smeeks. You can also find new items that are in. Most recently was a post about the Butter London nail polish fall collection that is now in the store. Another recent post featured moccasins that are available in Frances Studio. Make sure to check out Frances on Camelback Road and online. With the indecisive Arizona weather, it is hard to tell which season to dress for. Although fall is among us, the blazing summer heat is still going strong! As much as we would all like to rush to the store and buy those eye-catching riding boots and double breasted trench coats, they are just not weather appropriate. Here is some good news for college kids facing financial adversity...your summer brights are here to stay! 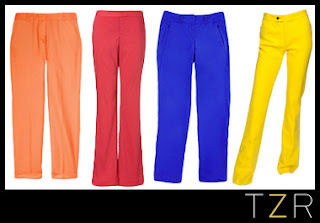 Bright colors are always a staple in the summertime so having these in stock in your closet should not be a problem. For fall, a great way to flash your brights is to incorporate them into your basic dress code. “My rule of thumb for styling them is simple: just swap each pair with your go-to jeans or classic trousers while keeping the rest of your outfit the same," said Rachel Zoe on her site. Some picks from Rachel Zoe's Zoe Report. Color is a fun way to add some pizazz to your outfit. This season think big and bold when choosing your brights. It is a sure way to spice up your fall wardrobe and make it something to talk about. Color is the theme of fall and the vibrant eye-popping colors will make a huge statement. 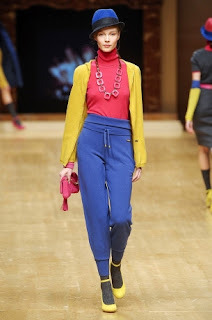 Bright colors were seen all over the runways of fashion weeks this season. From 3.1 Phillip Lim to Prada, there wasn’t a runway missing this attention-grabbing trend. A few of the colors showcased included: magentas, bright orange, cobalt blue, aqua and yellow. Keeping your budget in mind, this is one fall trend that will be effortless to keep up with. Just mix your favorite bright pieces that you already own with more weather appropriate accessories and you are good to go. If you want to up your style a little more, try some color blocking! Color blocking is when you mix two or more shades of colors creating a striking effect. Mix colorful prints or solids; you really can’t go wrong with this look. So instead of sticking to the rusty browns, golds, blacks and dark grey hues we are all familiar with for fall, try something new and mix in some vibrant shades to your seasonal wardrobe. Botkier: From Soho to Miami – All in the Name of Shades! Since arriving on the handbag scene in 2003, Botkier has become an internationally known accessories brand on the high-fashion scene. 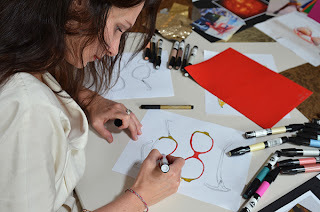 We interviewed owner and CEO Monica Botkier on her new sunglass line, which came out last month. “Accessories are my true love”, Botkier said. Among her famous handbags, designer Botkier has also gone on to shoes, belts and now . . . sunglasses! A look at the designing process. After winning the Council of Fashion Designers of America and Vogue Eyewear contest (along with Rebecca Minkoff and Yeohlee Teng), Botkier has created their sunglass line based on Miami style. "Miami is a an electric city, hot and vibrant with fashion, art and Cuban influence," Botkier said. Being that Botkier has always been a New York-based brand, it was “an exciting experience to go on-location to feel the vibe of the city”. The reason for debuting a sunglass collection in the fall season? As a native New Yorker, Botkier began her career as a fashion photographer, living and working downtown when she had the idea for the now-classic Trigger bag in 2003. Botkier got the idea to create a bag for herself because "designer bags out there were not functional enough and too expensive", so she took the leathers she intended for her portfolio and brought them to a manufacturer. Her friends started asking her to create bags for them too, which has now turned into a cult following of sorts. “The whole idea behind designing and creating a brand is expressing a point of view. I never design anything I wouldn't wear myself. Part of the fun is being creative and allowing yourself to explore,” Botkier said.